Nowadays, if you want to transfer a file from one computer to another, you’d just send it over the network. In those rare occasions where that won’t work, a USB thumb drive will do. It wasn’t always this way, and it was much more confusing; back in the day when we had floppy drives. We had floptical drives. A single unlabeled 3.5″ floppy disk could be formatted as 360, 720, or 1440k IBM drive, a 400, 800, or 1440k Macintosh drive, an Apple II volume, or an Amiga, or an Acorn, or a host of other logical formats. That’s just one physical format of a floppy disk, and there are dozens more. For this year’s VCF West, [Foone], hardware necromancer and collector of rare and esoteric removable storage formats, brought out the goods. He has what is probably the most complete collection of different floppy drive formats on the planet, and they were all out on display this weekend. VCF West is happening this Saturday and Sunday at the Computer History Museum in Mountain View, CA. 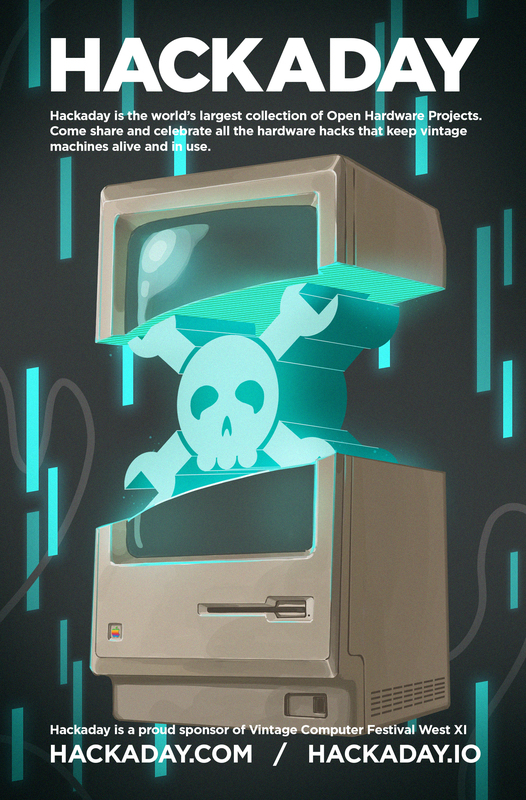 This on of our favorite events; a celebration of the hardware that paved the way for our modern world. VCF attracts an impressive amount of rare and interesting computers and other technology items. That hardware doesn’t make it to the festival on its own. The people at VCF — exhibitors, speakers, attendees, etc — are themselves an incredible collection of stories from salvage and restoration to the inside story on the teams that made the computers in the first place. Check out some of Brian Benchoff’s coverage of VCF East earlier this year. I ran into Vintage Computer Federation President Evan Koblentz ten days ago and he shared an interesting anecdote I think you’ll enjoy. Bil Herd was a featured speaker at VCF East a few years back. He was the Senior Design Engineer behind the Commodore C128 — obviously a fascinating person to headline the event. The year after Bil spoke at the festival, Evan as surprised to run into him wandering around the event again. Bil didn’t just want to speak, he wanted to see all the cool stuff and has attended, spoken, and conducted workshops at several of the festivals since. Who will show up this year is anyone’s guess. But we know this event is incredible and you will be amazed at who you run into. It is important to recognize where our technology comes from, to celebrate those who made it happen, and to encourage young people to start on the path to becoming a computer engineering wizard. For all of these reasons we are happy to be sponsoring VCF West. On the inside cover of every festival program you’ll find this epic art by our Illustrator, Joe Kim. You can also click the image on the right to embiggen. 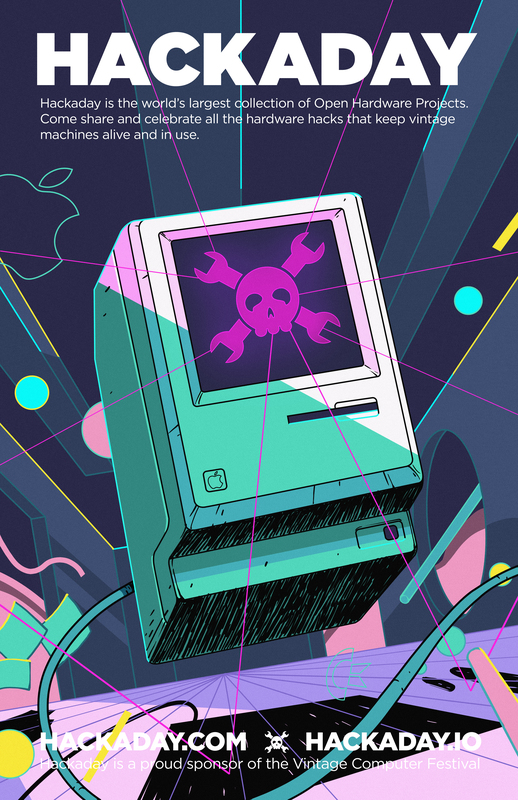 Joshua Vasquez will on hand for Hackaday at VCF West. He’s looking for the best bits to feature on our front page. If you want get a hold of him to show off your wares, or to grab some excellent Hackaday stickers, hit him up on Hackaday.io.